The Match FC hub has a CNC machined 6061-T6 aluminum hub shell, 1-pc chromoly driver with a needle r..
Cult Match Cassette Hub ﻿-6061 T6 Aluminum Hub Shell-14mm Heat Treated chromo axle-7075 T6 Allo..
Cult Match v2 Cassette Hub ﻿Material: 6061-T6 aluminum hub shellAxle: 14mm hollow chromolyAxle ..
Our 2013 front hubs features a CNC machined 7075 aluminum hub shell with wide set flanges to increas.. The Vandero hub is back and better than ever. This new PRO version of the Vandero is a precision sea.. The Proper Microlite Magnalite Rear Cassette Hub - RHD Male features a new 'shim' system to replace ..
36H 7075 cnc machined body with extra machining to protect spokes head 14 mm heat-treated femal.. Regular, 1pc Male Axle, small flanged hub. Male 1pc, 7075 Axle2 BearingsCNC Machined throughout.. The Shadow Conspiracy BTR cassette hub features a 6061 aluminium hub shell with a 17mm nickel-chromo.. Shadow BTR II (bold type rapror) SDS Rear Hub features a new SDS (switch drive s.. 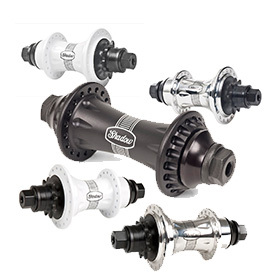 The Shadow Optimized freecoaster is much more than the next step in Shadow hub design. The performan.. Product OptionsDetailed Description-7075 Aluminum body and cone washers-2 sealed bearings-4140 cromo.. The Shadow Conspiracy Raptor Cassette:4 pawl driver with individual leaf springs5 sealed bearings606..
﻿Shadow Raptor Freecoaster:Shadow bursts onto the freecoaster scene with a bang with the bombproof R.. The Shadow Symbol front hub packs incredible value and quality unlike any other front hub we have cr.. The Shadow Symbol Cassette is the result of an effort to create the most reliable, refined, and well.. The Stranger Ballast Front Hub is a thick bodied 36h front hub with extra thick flanges and built in..
New design now available with built in Primo nylon guards. 9T cassette. Specifications: DS ..